Inspired by rebellious styles of the 1950s, greaser hairstyles are vintage cool looks that have come back on trend in a big way. Modern rockabilly and vintage greaser styles are all about sky high pompadours and slick, sculpted styles. 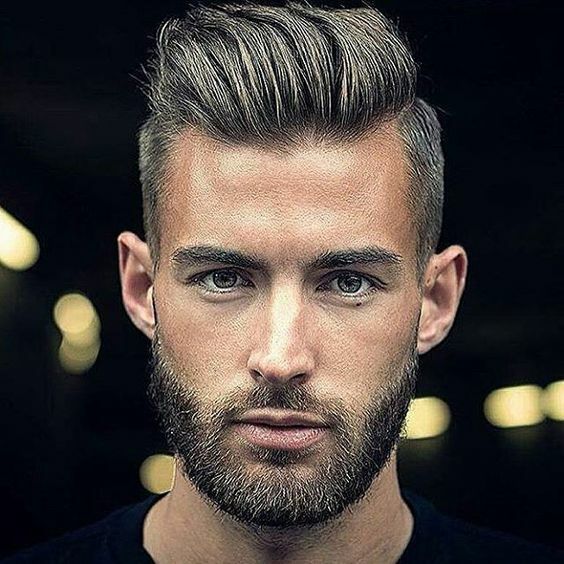 These looks required high quality hair products, whether you opt for an oil based pomade for the ultimate hold, or less intense styling creams for greaser hair styles with soft texture and movement. 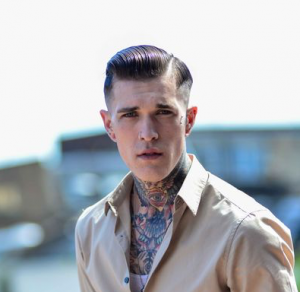 Keep reading to check out some of our favorite rockabilly and greaser hair styles for men. 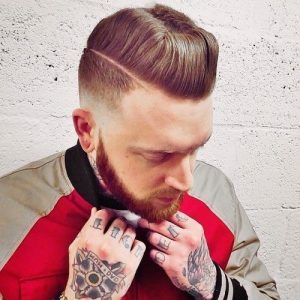 Mixing the modern undercut trend with a slick greaser style, this haircut is perfect for men who want a low maintenance look with a bit of rockabilly inspiration. 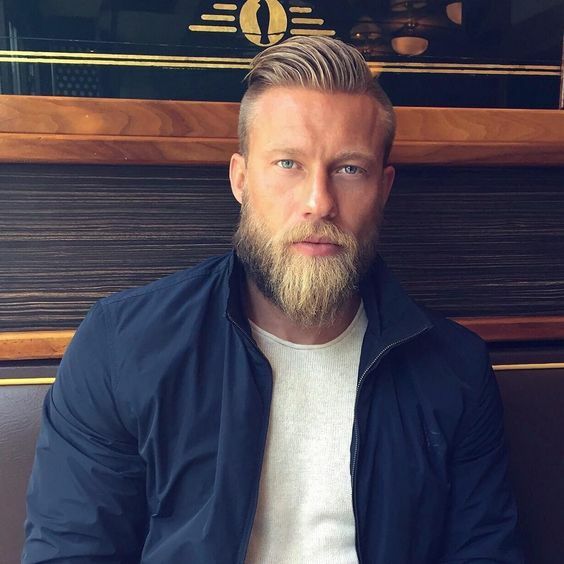 The short sides on this style will help to slim your face and define cheekbones, and will keep you looking manicured even with a full beard. The pompadour is a classic greaser hair style for men, but it takes a certain amount of styling time to pull off. 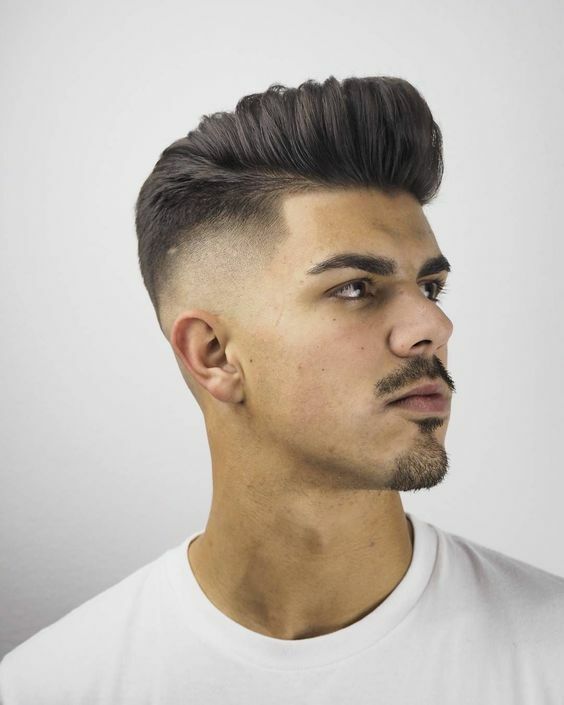 This slick drop fade means you won’t have to worry about styling hair at the back and sides of your head, and you can focus all your efforts on top. If you want something more modern and casual than a super slicked style, this tapered cut brings greaser inspiration to a softer look. Men with thick hair can ask to have lots of texture cut into the longer top section, making it easier to style into place. 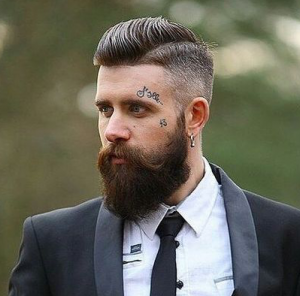 Hard parts are a great way to bring vintage barbershop charm into your everyday style. 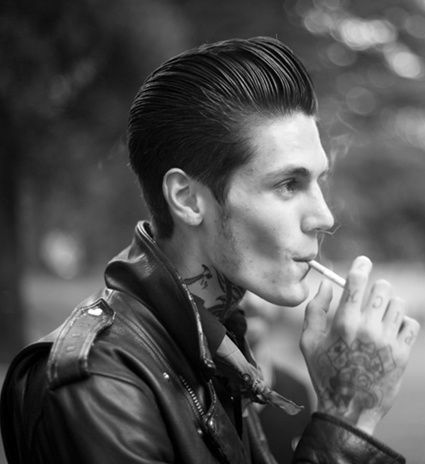 As a technical element, they also help create definition in side slicked looks like this edgy greaser hair style. 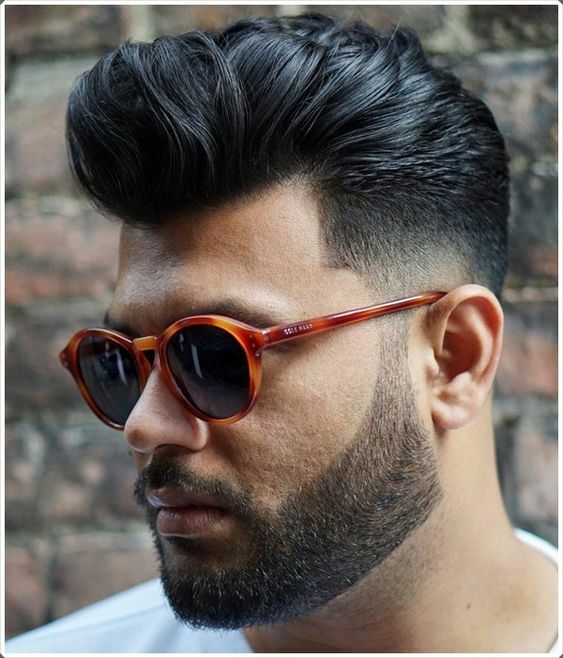 Want the pompadour shape without all that precise combing? 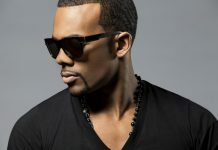 This softly textured style is a great option for men with very thick or wavy hair that’s hard to keep in place all day. With a slight wave carved into the fringe, this greaser hair style merges retro edge with military precision. 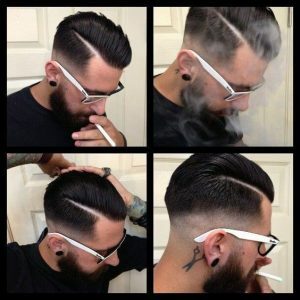 If you’ve always wished you looked like Elvis, a retro pompadour hairstyle is worth trying at least once in your life. 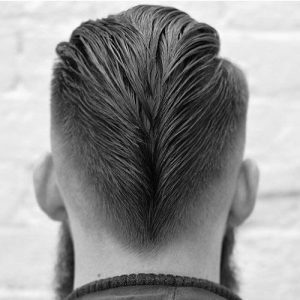 To create the iconic shape, you’ll need to blow dry your hair into a pompadour before adding high hold product. 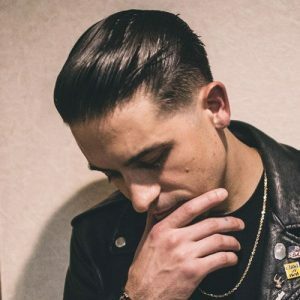 For haircuts that are long on top and shorter at the sides, pushing your hair back or to the side is an easy way to get a softer greaser hair style without a ton of product or time in front of the mirror. 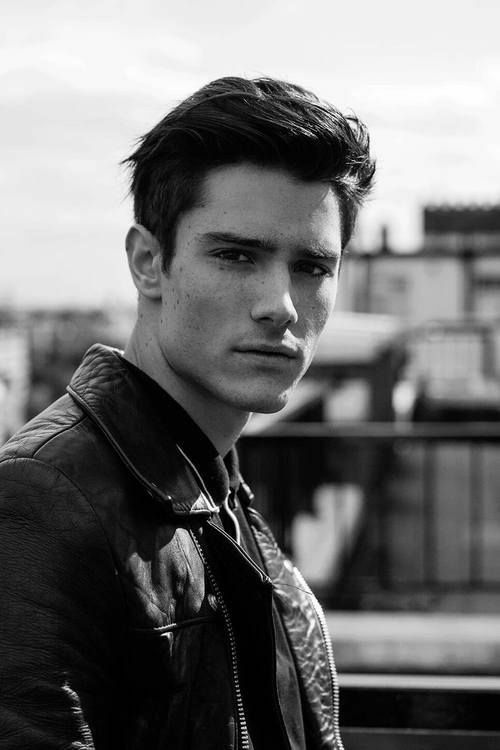 Mix ’50s greaser style with ’90s boy band heartthrob, and you get the ultimate cool style. 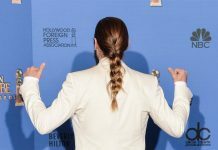 To get this intentionally messy look, use your fingers instead of a comb to distribute product and sweep hair back. 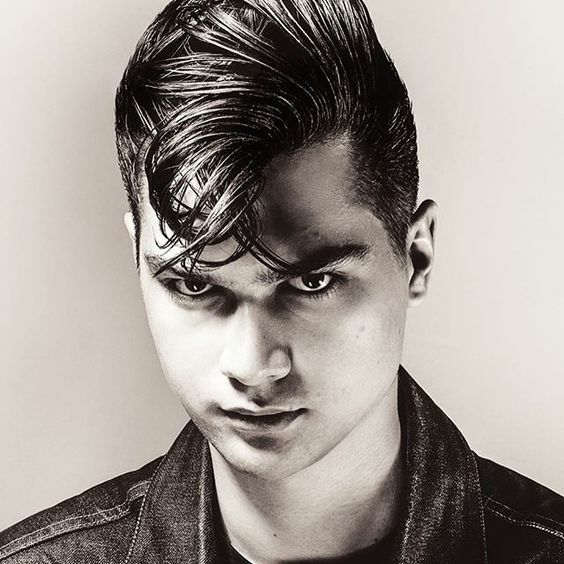 This sculpted pompadour hairstyle is a modern greaser masterpiece, with every hair perfectly in place. A lower undercut leaves more hair on top for you to style, but still keeps things easy when it comes to upkeep. If you’re only looking to add a touch of vintage appeal to your hair, this modern style is a professional option that suits any face shape. 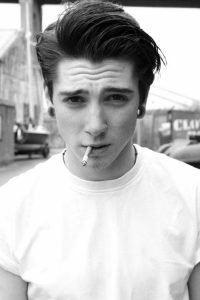 We love this classic pompadour for guys who are fully committed to wearing a greaser hair style. The tapered cut leaves hair shorter at the sides, but you’ll still need to use product to keep it swept back and in place. 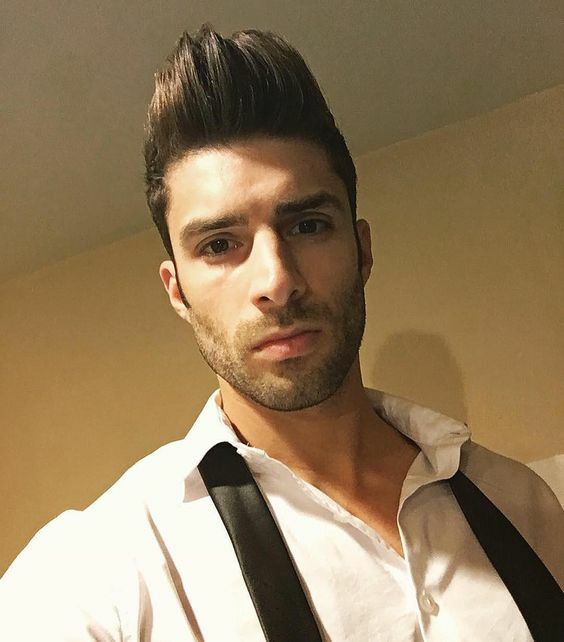 As close relatives to the pompadour, quiff hairstyles feature hair that’s brushed up instead of back and away from the face. It’s a good option for guys who want more softness and flexibility in their greaser hair style. Greaser edge meets modern hipster flair in this slicked back style paired with a close undercut. 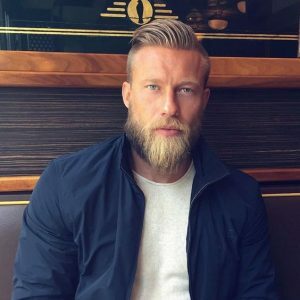 Leaving your hair this long on top doesn’t take more time to style, and leaves you with the option of tying it back when you’re playing sports or at the gym. A classic feature of greaser hair styles, the ducktail combs hair together at the back of the head to create this unmistakable shape. You can pair this advanced greaser element with many of the looks on our list. 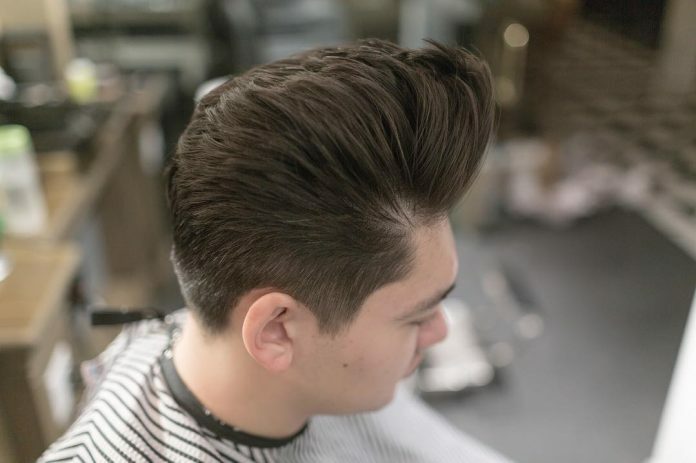 If you’ve got thick hair that’s hard to keep firmly in place, this softly styled pompadour is a nice option that also allows for more movement throughout the day. 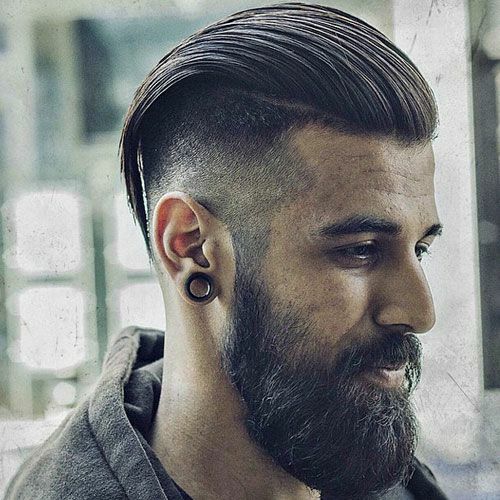 With slicked hair, a hard part, and disconnected undercut, this greaser hair style is one of the edgiest looks on our list. 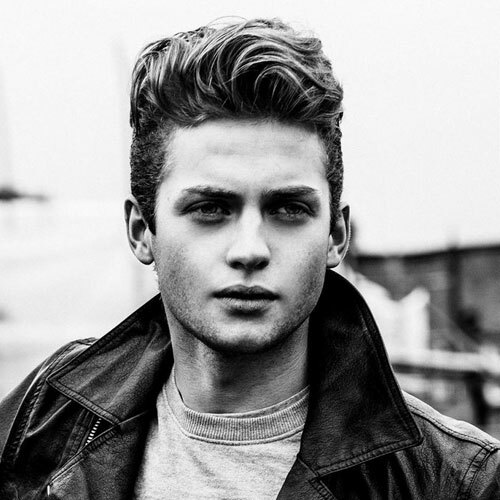 Hair with a naturally wavy texture adds some extra interest to typical quiff styles. 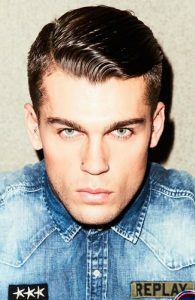 To get this style, we recommend using a volumizing mousse on damp hair, then following with a lighter hold product to finish. 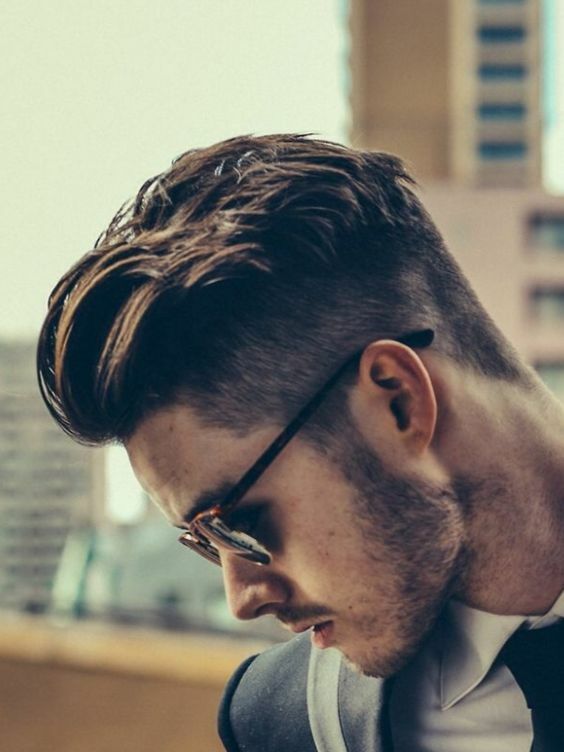 This high pompadour hairstyle puts some modern flair in the vintage look. 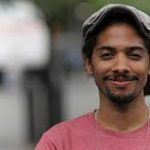 It may take a while to get just right, but you’ll be rewarded with a face that looks slimmer and the illusion of added height. Try these jelly roll bangs to find out why some women are so in love with a face framing fringe. 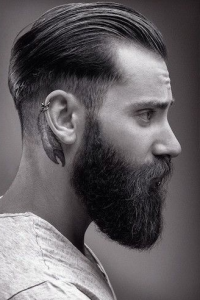 On days when you don’t want hair falling in your face, this longer haircut can be slicked back instead. 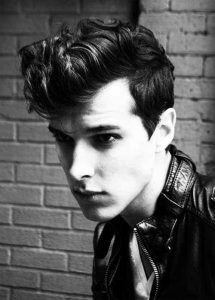 The high sides of this pompadour hairstyle create an ultra sculpted silhouette for more dapper greaser guys. 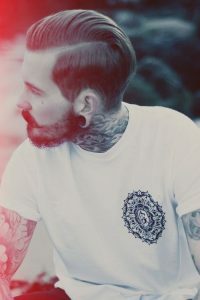 With shorter sides and a brushed up top, this pompadour hairstyle keeps things modern and casual. If you’re not into the commitment of a shaved part, this softly parted style is a nice way to wear your hair slicked for a special occasion. Medium hair is the perfect length for slicked looks that stay in place and show off a wraparound undercut.